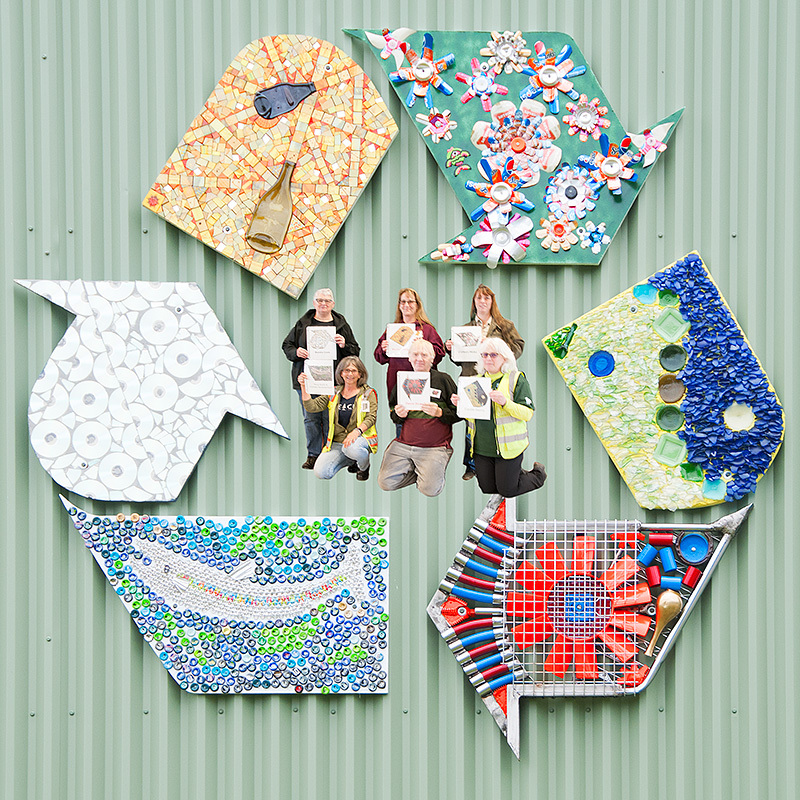 VAA and VCRS… Bringing the community together through the Art of Recycling! Nicolene Jordan… made a mosaic out of used repurposed colored window glass, mirrors and slumped bottles. Colleen Wake… used leftover cans from her 2011 Wearable Art creation “Recycled Egyptian Mommy” made out of 400 aluminum cans. Even the nails and screws were reused! Carole Henry… told me Nicolene advised her how best to use curved glass pieces, to use them like a pistachio shell to make 3D mosaic artwork. Carole used blue glass bottles collected by Lucy Knight and other broken glass bottles in a Yin Yang design. David Dinkel… used a fan blade from a car that will turn in the wind. He also used copper tubing, parts of a hamper frame and handicapped shopping cart. Sandra Cook… used CD’s since they are very bright, but also to make us think about how many things from the past become obsolete so quickly. Take a closer look the next time you go to the VCRS Recycling / Drop Off Center! They are located next to the animal shelter, which is next to the Central Landfill. Follow the smells. You will see a big green building at the end of E. Chanlyut Circle, that’s it. There is a NEW large, artistic Universal Recycling Arrow symbol on the building!! Can you figure out which artist made what part of the symbol? Valley Community for Recycling Solutions (VCRS) is a non-profit organization, serving the recycling needs of the Mat-Su Borough and surrounding areas. They provide a community service as a drop-off facility, accepting clean, separated household recycling: paper, plastic, metals and more. To learn more about recycling, visit www.valleyrecycling.org. Valley Arts Alliance (VAA) is also a non-profit organization. We are a place for both new and established artists of all types—painters, sculptors, musicians, and those involved in the performing arts—to network and to experiment with new ideas and media. We work with local libraries, schools, museums, art councils, and music and art groups to create more venues for the arts, and to help promote art related events. For more info visit www.ValleyArtsAlliance.com. VAA, bringing the community together through the arts!